Help with Fruit Identification - Plum, Damson? I came across a tree tonight in my mum & dad's street. It has loads of fruit hanging from it. My dad thinks it's some sort of plum tree, I'm not so sure. 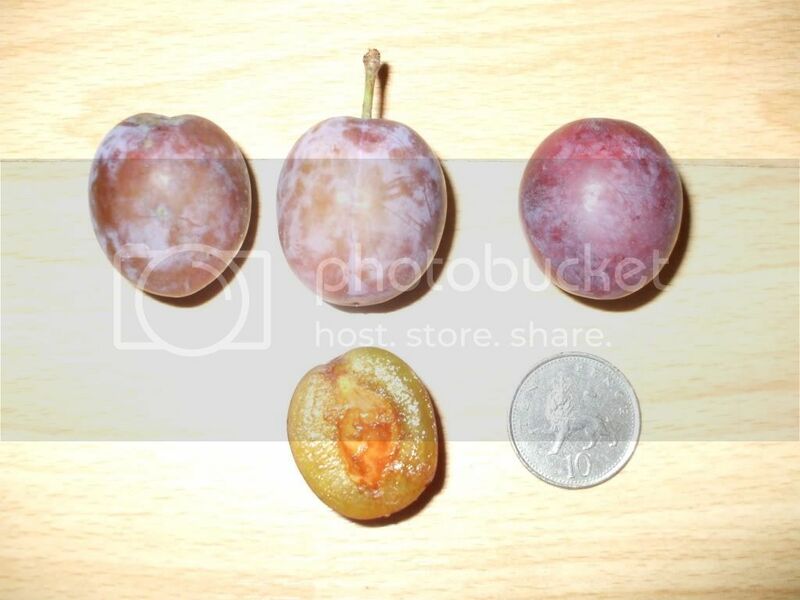 I've attached a picture of the fruit as well as a picture of what the tree looks like (tree picture is copied from the web). When the fruit is on the tree it appears to be purple in colour - this is due to a sort of film that is on the fruit. Once they are picked the 'film' comes off and they appear to have a different purple colouring. There are no thorns on the tree. I have opened one of the fruits up. The flesh is yellow/ green in colour. I have had a bite of the fruit and it has a slight sour taste. 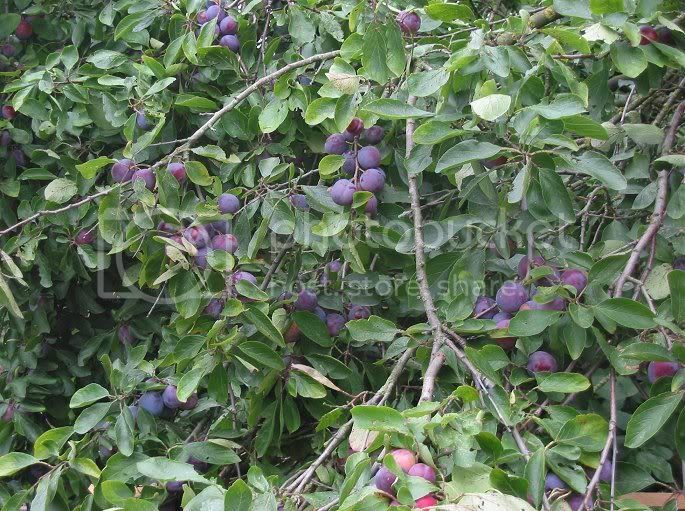 The picture of thee tree from the web stated it was a damson plum tree. There is a family debate going on about this at the moment so any help would be much appreciated. Welcome Leanne to the forum - we have a Victoria plum tree in our garden - and these are too small and dark for that - ours are also sweeter than what you describe. We have been foraging on and off over the years, and we're convinced that what you have are damsons. [Image Can Not Be Found]It looks like what we always call a bullace tree, a sort of wild plum. Damsons are similar but more oval shaped, though names might vary depending on where you live. The fruit are slightly sour when raw and wonderful when cooked. Happy picking! Every day I give my family two choices for dinner... Take it or leave it! Bullace are, I think, green' a wild greengage. This looks like a wild plum or miraibel plum tree. Makes wonderful jam and chutney. A lovely find. Ooh, two new members in one post! Welcome ladies, thank you for joining in. lol everyone a different answer!! the rest are simply called wild plums. Those tend to be smaller than damsons in my experience. But I think it is a very fluid thing! Shelley, I thought the same - the mirabelles that we've had were always small, round and yellow. However, I think that Leanne's picture from the web may be a bit misleading - perhaps looking at the fruits next to the 10p coin are not as dark as the fruits pictured on the tree. Whether they be wild plums or damsons or bullaces (I thought bullaces were similar to mirabelles, too! ), they'll still make good preserves or wines - I'm sure, Shelley, you would be able to do something with them !!! Good Luck Leanne, with whatever you decide to make with them! Many thanks for all of your replies. You have all been so helpful and welcoming to this site. I think they are some sort of plums, my dad wins! I spotted another of the 'unknown' plum tree just further up from the first one. Both are completely laden with fruit. So much so that the branches are touching the grass under the weight of the fruit. Yipee! Plan on collecting more very soon. I'm hoping the 'unknown' plums make lovely jam. I am a newbie to foraging. I only started to collect berries about a month ago. Since then I have found that I have become a bit of an addict. Is it possible to be a foraging addict? I now can't walk or drive anywhere without keeping my eyes peeled for berries. As a newbie, I'm going to stick to making jam/ jelly at the moment. Hopefully I'll be more adventurous as time goes on. I have spent the last 4 hours de-stalking elderberries that I spotted in my local park. I keep telling myself the effort will be worth it. My freezer is currently crammed with berries that I have collected. I have 24lbs of the 'unknown' plums, 2lbs of elderberries, 3lb of blackcurrants (that my friend donated to me) and masses upon masses of brambles. My last bramble collection ended with me finding a lovely tick stuck to my leg when I got home. Needless to say I was horrified and screamed the house down. Overreaction now behind me, it will not put me off collecting more. My friend also has 2 huge apple trees in his garden which I have pilfered. Just need to collect jars, which is taking ages. I'm so impatient as I just want to get started on my jam. I have asked everyone and anyone to keep jars for me. On that point, can anyone recommend websites where I can buy jars cheaply? I was thinking of purchasing some supermarket own brand jam, just so I can use the jars! Sorry if this post is rather long. I'm just so happy I have found other people who love foraging as much as me! My boyfriend is sick of hearing me talk about it. He thinks I am mad but I'm sure once my homemade jam is made, it will keep him quiet! This site is invaluable to me and has given me so many tips and ideas. I just hope you don't mind me asking more questions, whenever I need a bit of advice! Hi Leanne. Yes I reckon foraging is addictive, its like treasure hunting isn't it? I had the same thought as you about buying cheap supermarket brands, just to dispose of the contents and use the jars - or in my case it was bottles I needed, for the lovely syrups I'm hoarding for winter drinks. I haven't actually resorted to doing that yet, but it may come to that. I'm also on the look out for small jars. Empty spice jars are handy for odd amounts but I'm looking for some twice that size for gifts. Foraging is wonderful! I had to go to a birthday party on Sunday afternoon and was quite disappointed not to be able to spend the time in my vegetable patch, but lo and behold, the party givers had a crab apple tree dripping with fruit that they didn't intend to use, so I emptied the presents out of my basket and filled it to the brim with crab apples. Glad you enjoy foraging !! I became a real addict last year and like you scour every hedgerow for available fruit!! the other day i passed two chestnut trees that i had passed countless times before and noticed they were sweet chestnuts not conkers ,i have only driven past them for 35 years so not surprising iv'e not noticed before . Is that like the stuff they put on crepes - that's really scrummy. Leanne - great to see you joining in with such enthusiasm and gusto! We think the mystery fruit are wild cherry plums. By coincidence, Fiona has made a batch of jam with them this afternoon. Really, really scrummy. Love the user name, Caroline! Welcome on board. I think you must win a BPTSSNTACSH award (Best Profile That Says Such Nice Things About CSH ) . Lovely. Thank you very much.